Every morning, the fine folks at Sports Radio Interviews sift through the a.m. drive-time chatter to bring you the best interviews with coaches, players, and personalities across the sports landscape. Today: some folks, like Roger Goodell, just won't let Spygate die. 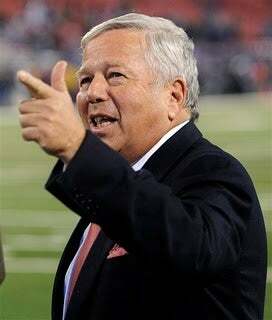 Robert Kraft joined WEEI in Boston with The Big Show to discuss his pain to see the Patriots not make the Super Bowl, Goodell bringing Spygate back up, why he's optimistic that there won't be a lockout, what the biggest hurdles are to getting to that point and explaining fixing the NFL presently to ensure continued success in the future. "If anyone had said at the beginning of year that our team would go 14-2 and we would wind up with a bye … Each of the [previous] times we had a bye we went to the Super Bowl. We weren't sure we were anywhere near that good of a team at the beginning of the season, but the buildup and the expectations and the kind of team we had … it was pretty special." "I must tell you, this is three and a half years later. I can't speak for why other people do things or don't do things. I can just tell you that I'm tired of the whole subject and it's not something I'm going to discuss with anyone." "I'm speaking for myself when I say this. Knowing what I know about what's going on, what the numbers are on both sides, knowing that we have a quality product that's getting great ratings … people want our product, so, today in America, where a lot of companies have to cut back … we have something that we can grow and build on and benefit all parties. It would really be criminal if we can't find an agreement in the next month." "To simplify it … in our haste of doing a deal and keeping things going, we did a deal that was too favorable to the players. … When you have a business and a thriving partnership like we have now, it's never good for one side to get the edge of the other. In the end it's going to come back and bite you in a way that doesn't work. That's what's happening now." "You have to plan for the future and anticipate problems and try to fix it before those problems become too great. … It's really the distribution of revenue. That incremental percentage that is going to the players is really money that should be invested in developing the business." • Jay Gruden knows haters gonna hate. • Andy Pettitte guarantees he's not going to try a midseason comeback. We've heard that before, elsewhere. • Mike Tyson has faith in Charlie Sheen. A ringing endorsement.